We've Had Enough Fallout Dogs. It's Vault Cat's Time. I can see how dogs like the one in Fallout 4’s reveal trailer would be useful companions in the wastelands, would be useful companions in the wasteland, but let us consider a cat patient enough to be dressed up in Vault 111 gear for a cosplay shoot. Your average cat would be a horrible wasteland companion. It would not intervene in a battle with mutants to save your life. It would not drag your body to shelter should you succumb to the elements. It would not, as a matter of fact, follow you at all. At best it would show up from time to time, long enough for you to think “Hey, it’s that cat” and then disappear. But not Redditor and professional cat dresser Freyu’s cat. Freyu’s cat is loyal, having put up with being dressed as everything from Pyramid Head to Ganondorf. Vault Cat is stalwart, standing up for what his or her (not checking) owner believes in, be it wearing goggles or having a large glowing electronic thing strapped to its arm. Vault Cat can find hidden items in staged scenes. 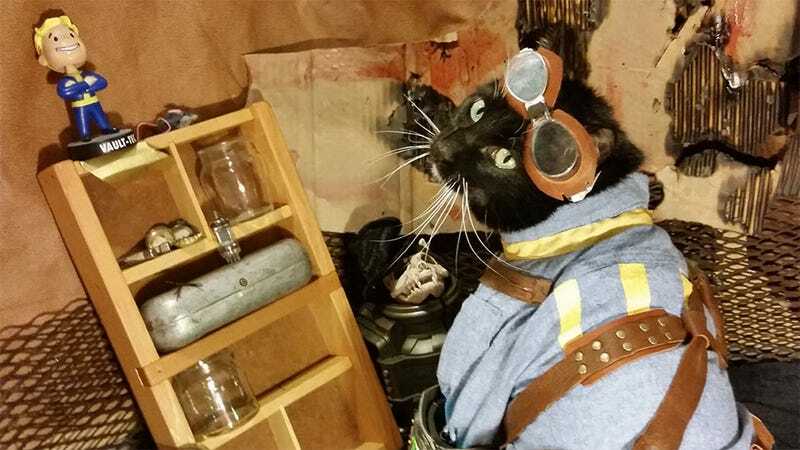 Vault Cat has no idea what the hell is going on, but then who really does in the post apocalyptic world of Fallout? He or she is just a cat in a number-coded outfit, trying to survive. See more pictures of Vault Cat and maybe learn how to make an outfit for your cat to get your blood all over at Cat-Cosplay on Tumblr.